The work of an enamored and well educated student of jujutsu also evolved the jujutsu into a new art now practiced the world over - Judo. Jigoro Kano began studying the jujutsu system of the Tenshin Shin'yo ryu (a system known for its techniques of percussion in addition to grappling skills) where he quickly became fascinated and fell in love with the art. Seeking as much knowledge as possible he went on to study the Kito Ryu. This jujutsu system emphasized self-perfection and specialized in throwing techniques, practiced in kata and by a method known as Ran O toru, meaning to take free action. Kano adopted this training method (known today as randori) into his new system which stressed the practice of safe techniques. Kano did not stop there, however. He continued to research various systems and methods throughout his life (such as the Seikiguchiryu, a system influenced by Sumo) as well as the seigo ryu. Kano truly loved jujutsu and saw it as a national treasure. But, he also feared that its disorganized and dangerous methods of training and practice would lead to its extinction. Kano thus set about to create a new method which would in essence preserve the important principles while adapting them for safe use in order to serve multiple objectives. He brilliantly preserved the percussive (striking) techniques of the Tenshin Shin'yo jujutsu but kept them separate from regular practice. They were reserved for advanced practice due to their danger. He also modified and adapted the throwing techniques of the Kitoryu with the strangulation, joint locking and immobilization techniques of the Tenshin Shin'yo, sekiguchi, and seigoryu (amongst others). He did so in a manner which enabled them to be applied in free practice. He also kept the practice of Kata which were the mainstay of most classical systems. Kano thus developed a method which he envisioned as an entire way of life. In his "Judo," he developed an art whereby the trainee kept physically fit, perfected himself spiritually and mentally, and also learned effective self-defense skills (albeit modified to be more humane). Kano's new system was not without obstacles, however, and many of the old line classical systems held back no criticism. This criticism was largely silenced by a match in 1886 between his Kodokan Judo School and that of the Yoshin ryu (jujutsu) organized by the Tokyo police department. Kano's school won thirteen victories, one draw and only two losses out of fifteen individual matches. This event paved the way for acceptance of the Kodokan Judo, and it was eventually adapted into Japanese public school instruction as well as various law enforcement academies and military academies. One of Kano's greatest legacies was his adoption of uniforms for practice, standardization of ranking (kyu/dan systm), adoption of a belt system (white and black belts) and development of systematized teaching methods. So successful were his innovations, that they were adopted throughout most all modern Japanese martial arts (jujutsu, daito ryu, kendo, kyudo, karate, etc.) as well as many other systems around the world. 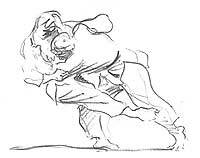 The other great innovation of judo was the standardization on techniques that could be safety practiced against others, and in competition. As a result, the techniques themselves became highly refined. Practitioners benefited too. Continued hard practice allowed them to develop a level of personal skill and reflexes difficult to achieve with former jujutsu arts which could be dangerous if practiced at full speed and power. Kano's efforts to reform jujutsu may have been inspired by an earlier and similar transition that happened to sumo. In Edo (present day Tokyo) Sumo had by the mid-1600s degenerated from ceremonial contests to rough and tumble brawls in tournaments and street corner pickup bouts. To check the problems the government briefly outlawed the contests in the mid-1600's, and they were only allowed again when an elaborate set of rules and regulations to reduce the violence were developed. It is largely the result of the development and promotion of judo that jujutsu became known in western culture, and it is fair to say that many jujutsu systems in existence in the west today derive from Kodokan Judo. In fact a great resurgence of interest in judo/jujutsu has recently occurred in the west due to the brilliant efforts and innovation of the Gracie family of Brazil. Gracie Jujutsu stems from Kodokan Judo and was inspired by the effort of a young traveling fighting instructor by the name of Mitsuyo Maeda. Maeda, using a Nom de Guerre, traveled throughout the world taking on all comers, earning a living and testing the effective application of the techniques and principles he learned at the Kodokan. Maeda eventually settled in Brazil and became the teacher of Carlos Gracie. Gracie's family made further innovations and brilliant adaptations to that which they were taught by Maeda, particularly in the area of ground fighting. This new branch was courageously championed and promoted by Helio Gracie and family in the United States and throughout the world. It can thus be said that jujutsu is a practice that will long endure in its varying forms and that perhaps a new meaning to the character of "JU" may be applied in its ability to yield to the ever-changing needs of its practitioners.